Tiffany sunglasses are undeniably best sunglasses gift of all brands. Every pair of Tiffany & Co sunglasses is packed in Tiffany signature lacquer case and Tiffany blue box. Each pair includes silk glasses pouch and a cleaning cloth. The most beautiful boxing set on the market. Tiffany sunglasses are a real eyewear treat. They are elegant and jewellery like, often decorated with Tiffany charms and diamonds. Tiffany aviators are must have for their elegance and not even a hint on sport. Only Tiffany can make aviator sunglasses so tastefully ornamented with studs and charms. Tiffany sunglasses will make everyone look rich and fashionable. 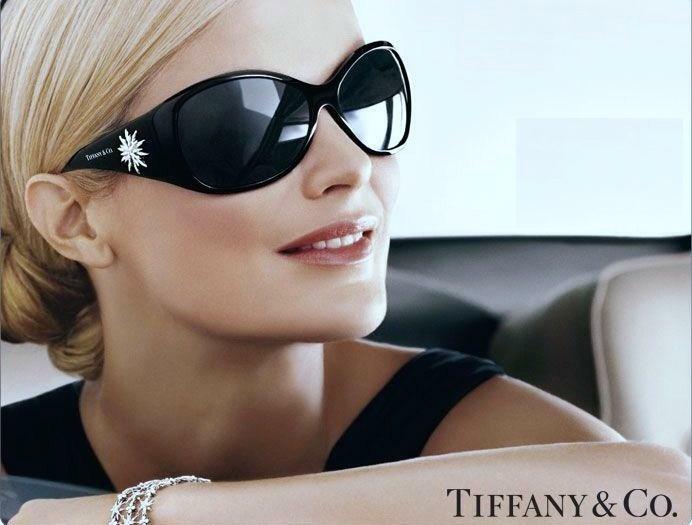 Buy authentic Tiffany sunglasses at Eyeinform website with complete manufacturer packaging. Shop for complete collections of Tiffany sunglasses online for fast shipping and easy returns. Buy Tiffany TF4155 sunglasses online at a friendly price. Originally made in 2018, Tiffany 4155 are lightweight plastic frames. Each pair of authentic Tiffany sunglasses ships worldwide with authenticity certificate, Tiffany box, case and a cleaning cloth. Buy Tiffany TF4154F sunglasses online at a friendly price. Originally made in 2018, Tiffany 4154F are lightweight plastic frames. Each pair of authentic Tiffany sunglasses ships worldwide with authenticity certificate, Tiffany box, case and a cleaning cloth. Buy Tiffany TF4154 sunglasses online at a friendly price. Originally made in 2018, Tiffany 4154 are lightweight plastic frames. Each pair of authentic Tiffany sunglasses ships worldwide with authenticity certificate, Tiffany box, case and a cleaning cloth. Buy Tiffany TF4153F sunglasses online at a friendly price. Originally made in 2018, Tiffany 4153F are lightweight plastic frames. Each pair of authentic Tiffany sunglasses ships worldwide with authenticity certificate, Tiffany box, case and a cleaning cloth. Buy Tiffany TF4153 sunglasses online at a friendly price. Originally made in 2018, Tiffany 4153 are lightweight plastic frames. Each pair of authentic Tiffany sunglasses ships worldwide with authenticity certificate, Tiffany box, case and a cleaning cloth. Buy Tiffany TF4152 sunglasses online at a friendly price. Originally made in 2018, Tiffany 4152 are lightweight plastic frames. Each pair of authentic Tiffany sunglasses ships worldwide with authenticity certificate, Tiffany box, case and a cleaning cloth. Buy Tiffany TF3063 sunglasses online at a friendly price. Originally made in 2018, Tiffany 3063 are lightweight metal frames. Each pair of authentic Tiffany sunglasses ships worldwide with authenticity certificate, Tiffany box, case and a cleaning cloth. Buy Tiffany TF3062 sunglasses online at a friendly price. Originally made in 2018, Tiffany 3062 are lightweight metal frames. Each pair of authentic Tiffany sunglasses ships worldwide with authenticity certificate, Tiffany box, case and a cleaning cloth. Buy Tiffany TF3021 sunglasses online at a friendly price. Originally made in 2018, Tiffany 3021 are lightweight metal frames. Each pair of authentic Tiffany sunglasses ships worldwide with authenticity certificate, Tiffany box, case and a cleaning cloth. Buy Tiffany TF4151 sunglasses online at a friendly price. Originally made in 2018, Tiffany 4151 are lightweight plastic frames. Each pair of authentic Tiffany sunglasses ships worldwide with authenticity certificate, Tiffany box, case and a cleaning cloth. Buy Tiffany TF4150F sunglasses online at a friendly price. Originally made in 2018, Tiffany 4150F are lightweight plastic frames. Each pair of authentic Tiffany sunglasses ships worldwide with authenticity certificate, Tiffany box, case and a cleaning cloth. Buy Tiffany TF4150 sunglasses online at a friendly price. Originally made in 2018, Tiffany 4150 are lightweight plastic frames. Each pair of authentic Tiffany sunglasses ships worldwide with authenticity certificate, Tiffany box, case and a cleaning cloth. Buy Tiffany TF4149F sunglasses online at a friendly price. Originally made in 2018, Tiffany 4149F are lightweight plastic frames. Each pair of authentic Tiffany sunglasses ships worldwide with authenticity certificate, Tiffany box, case and a cleaning cloth. Buy Tiffany TF4149 sunglasses online at a friendly price. Originally made in 2018, Tiffany 4149 are lightweight plastic frames. Each pair of authentic Tiffany sunglasses ships worldwide with authenticity certificate, Tiffany box, case and a cleaning cloth. Buy Tiffany TF4148F sunglasses online at a friendly price. Originally made in 2018, Tiffany 4148F are lightweight plastic frames. Each pair of authentic Tiffany sunglasses ships worldwide with authenticity certificate, Tiffany box, case and a cleaning cloth. Buy Tiffany TF4148 sunglasses online at a friendly price. Originally made in 2018, Tiffany 4148 are lightweight plastic frames. Each pair of authentic Tiffany sunglasses ships worldwide with authenticity certificate, Tiffany box, case and a cleaning cloth. Buy Tiffany TF4147 sunglasses online at a friendly price. Originally made in 2018, Tiffany 4147 are lightweight plastic frames. Each pair of authentic Tiffany sunglasses ships worldwide with authenticity certificate, Tiffany box, case and a cleaning cloth. Buy Tiffany TF3061 sunglasses online at a friendly price. Originally made in 2018, Tiffany 3061 are lightweight metal frames. Each pair of authentic Tiffany sunglasses ships worldwide with authenticity certificate, Tiffany box, case and a cleaning cloth. Buy Tiffany TF3048B sunglasses online at a friendly price. Originally made in 2018, Tiffany 3048B are lightweight metal frames. Each pair of authentic Tiffany sunglasses ships worldwide with authenticity certificate, Tiffany box, case and a cleaning cloth. Buy Tiffany TF4146F sunglasses online at a friendly price. Originally made in 2018, Tiffany 4146F are lightweight plastic frames. Each pair of authentic Tiffany sunglasses ships worldwide with authenticity certificate, Tiffany box, case and a cleaning cloth. Buy Tiffany TF4146 sunglasses online at a friendly price. Originally made in 2018, Tiffany 4146 are lightweight plastic frames. Each pair of authentic Tiffany sunglasses ships worldwide with authenticity certificate, Tiffany box, case and a cleaning cloth. Buy Tiffany TF4145BF sunglasses online at a friendly price. Originally made in 2018, Tiffany 4145BF are lightweight plastic frames. Each pair of authentic Tiffany sunglasses ships worldwide with authenticity certificate, Tiffany box, case and a cleaning cloth. Buy Tiffany TF4145B sunglasses online at a friendly price. Originally made in 2018, Tiffany 4145B are lightweight plastic frames. Each pair of authentic Tiffany sunglasses ships worldwide with authenticity certificate, Tiffany box, case and a cleaning cloth. Buy Tiffany TF4144BF sunglasses online at a friendly price. Originally made in 2018, Tiffany 4144BF are lightweight plastic frames. Each pair of authentic Tiffany sunglasses ships worldwide with authenticity certificate, Tiffany box, case and a cleaning cloth. Buy Tiffany TF4144B sunglasses online at a friendly price. Originally made in 2018, Tiffany 4144B are lightweight plastic frames. Each pair of authentic Tiffany sunglasses ships worldwide with authenticity certificate, Tiffany box, case and a cleaning cloth. Buy Tiffany TF4143B sunglasses online at a friendly price. Originally made in 2018, Tiffany 4143B are lightweight plastic frames. Each pair of authentic Tiffany sunglasses ships worldwide with authenticity certificate, Tiffany box, case and a cleaning cloth. Buy Tiffany TF4142BF sunglasses online at a friendly price. Originally made in 2018, Tiffany 4142BF are lightweight plastic frames. Each pair of authentic Tiffany sunglasses ships worldwide with authenticity certificate, Tiffany box, case and a cleaning cloth. Buy Tiffany TF4142B sunglasses online at a friendly price. Originally made in 2018, Tiffany 4142B are lightweight plastic frames. Each pair of authentic Tiffany sunglasses ships worldwide with authenticity certificate, Tiffany box, case and a cleaning cloth. Buy Tiffany TF4141F sunglasses online at a friendly price. Originally made in 2018, Tiffany 4141F are lightweight plastic frames. Each pair of authentic Tiffany sunglasses ships worldwide with authenticity certificate, Tiffany box, case and a cleaning cloth. Buy Tiffany TF4141 sunglasses online at a friendly price. Originally made in 2018, Tiffany 4141 are lightweight plastic frames. Each pair of authentic Tiffany sunglasses ships worldwide with authenticity certificate, Tiffany box, case and a cleaning cloth. Buy Tiffany TF4140F sunglasses online at a friendly price. Originally made in 2018, Tiffany 4140F are lightweight plastic frames. Each pair of authentic Tiffany sunglasses ships worldwide with authenticity certificate, Tiffany box, case and a cleaning cloth. Buy Tiffany TF4140 sunglasses online at a friendly price. Originally made in 2018, Tiffany 4140 are lightweight plastic frames. Each pair of authentic Tiffany sunglasses ships worldwide with authenticity certificate, Tiffany box, case and a cleaning cloth. Buy Tiffany TF3060 sunglasses online at a friendly price. Originally made in 2018, Tiffany 3060 are lightweight metal frames. Each pair of authentic Tiffany sunglasses ships worldwide with authenticity certificate, Tiffany box, case and a cleaning cloth. Buy Tiffany TF3059 sunglasses online at a friendly price. Originally made in 2018, Tiffany 3059 are lightweight metal frames. Each pair of authentic Tiffany sunglasses ships worldwide with authenticity certificate, Tiffany box, case and a cleaning cloth. Buy Tiffany TF4137BF sunglasses online at a friendly price. Originally made in 2017, Tiffany 4137BF are lightweight plastic frames. Each pair of authentic Tiffany sunglasses ships worldwide with authenticity certificate, Tiffany box, case and a cleaning cloth. Buy Tiffany TF4137B sunglasses online at a friendly price. Originally made in 2017, Tiffany 4137B are lightweight plastic frames. Each pair of authentic Tiffany sunglasses ships worldwide with authenticity certificate, Tiffany box, case and a cleaning cloth. Buy Tiffany TF4136B sunglasses online at a friendly price. Originally made in 2017, Tiffany 4136B are lightweight plastic frames. Each pair of authentic Tiffany sunglasses ships worldwide with authenticity certificate, Tiffany box, case and a cleaning cloth. Buy Tiffany TF4135B sunglasses online at a friendly price. Originally made in 2017, Tiffany 4135B are lightweight plastic frames. Each pair of authentic Tiffany sunglasses ships worldwide with authenticity certificate, Tiffany box, case and a cleaning cloth. Buy Tiffany TF4134BF sunglasses online at a friendly price. Originally made in 2017, Tiffany 4134BF are lightweight plastic frames. Each pair of authentic Tiffany sunglasses ships worldwide with authenticity certificate, Tiffany box, case and a cleaning cloth. Buy Tiffany TF4134B sunglasses online at a friendly price. Originally made in 2017, Tiffany 4134B are lightweight plastic frames. Each pair of authentic Tiffany sunglasses ships worldwide with authenticity certificate, Tiffany box, case and a cleaning cloth. Buy Tiffany TF3058 sunglasses online at a friendly price. Originally made in 2017, Tiffany 3058 are lightweight metal frames. Each pair of authentic Tiffany sunglasses ships worldwide with authenticity certificate, Tiffany box, case and a cleaning cloth. Buy Tiffany TF3057 sunglasses online at a friendly price. Originally made in 2017, Tiffany 3057 are lightweight metal frames. Each pair of authentic Tiffany sunglasses ships worldwide with authenticity certificate, Tiffany box, case and a cleaning cloth. Buy Tiffany TF4139 sunglasses online at a friendly price. Originally made in 2017, Tiffany 4139 are lightweight plastic frames. Each pair of authentic Tiffany sunglasses ships worldwide with authenticity certificate, Tiffany box, case and a cleaning cloth. Buy Tiffany TF4138 sunglasses online at a friendly price. Originally made in 2017, Tiffany 4138 are lightweight plastic frames. Each pair of authentic Tiffany sunglasses ships worldwide with authenticity certificate, Tiffany box, case and a cleaning cloth. Buy Tiffany TF4133F sunglasses online at a friendly price. Originally made in 2017, Tiffany 4133F are lightweight plastic frames. Each pair of authentic Tiffany sunglasses ships worldwide with authenticity certificate, Tiffany box, case and a cleaning cloth. Buy Tiffany TF4133 sunglasses online at a friendly price. Originally made in 2017, Tiffany 4133 are lightweight plastic frames. Each pair of authentic Tiffany sunglasses ships worldwide with authenticity certificate, Tiffany box, case and a cleaning cloth. Buy Tiffany TF4132HB sunglasses online at a friendly price. Originally made in 2017, Tiffany 4132HB are lightweight plastic frames. Each pair of authentic Tiffany sunglasses ships worldwide with authenticity certificate, Tiffany box, case and a cleaning cloth. Buy Tiffany TF4132BF sunglasses online at a friendly price. Originally made in 2017, Tiffany 4132BF are lightweight plastic frames. Each pair of authentic Tiffany sunglasses ships worldwide with authenticity certificate, Tiffany box, case and a cleaning cloth. Buy Tiffany TF4131HB sunglasses online at a friendly price. Originally made in 2017, Tiffany 4131HB are lightweight plastic frames. Each pair of authentic Tiffany sunglasses ships worldwide with authenticity certificate, Tiffany box, case and a cleaning cloth. Buy Tiffany TF4130 sunglasses online at a friendly price. Originally made in 2016, Tiffany 4130 are lightweight plastic frames. Each pair of authentic Tiffany sunglasses ships worldwide with authenticity certificate, Tiffany box, case and a cleaning cloth. Buy Tiffany TF4129F sunglasses online at a friendly price. Originally made in 2016, Tiffany 4129F are lightweight plastic frames. Each pair of authentic Tiffany sunglasses ships worldwide with authenticity certificate, Tiffany box, case and a cleaning cloth. Buy Tiffany TF4129 sunglasses online at a friendly price. Originally made in 2016, Tiffany 4129 are lightweight plastic frames. Each pair of authentic Tiffany sunglasses ships worldwide with authenticity certificate, Tiffany box, case and a cleaning cloth. Buy Tiffany TF4128B sunglasses online at a friendly price. Originally made in 2016, Tiffany 4128B are lightweight plastic frames. Each pair of authentic Tiffany sunglasses ships worldwide with authenticity certificate, Tiffany box, case and a cleaning cloth. Buy Tiffany TF4127 sunglasses online at a friendly price. Originally made in 2016, Tiffany 4127 are lightweight plastic frames. Each pair of authentic Tiffany sunglasses ships worldwide with authenticity certificate, Tiffany box, case and a cleaning cloth. Buy Tiffany TF4126B sunglasses online at a friendly price. Originally made in 2016, Tiffany 4126B are lightweight plastic frames. Each pair of authentic Tiffany sunglasses ships worldwide with authenticity certificate, Tiffany box, case and a cleaning cloth. Buy Tiffany TF3053 sunglasses online at a friendly price. Originally made in 2016, Tiffany 3053 are lightweight plastic frames. Each pair of authentic Tiffany sunglasses ships worldwide with authenticity certificate, Tiffany box, case and a cleaning cloth. Buy Tiffany TF3054B sunglasses online at a friendly price. Originally made in 2016, Tiffany 3054B are lightweight metal frames. Each pair of authentic Tiffany sunglasses ships worldwide with authenticity certificate, Tiffany box, case and a cleaning cloth. Buy Tiffany TF4122 sunglasses online at a friendly price. Originally made in 2016, Tiffany 4122 are lightweight plastic frames. Each pair of authentic Tiffany sunglasses ships worldwide with authenticity certificate, Tiffany box, case and a cleaning cloth. Buy Tiffany TF4121BF sunglasses online at a friendly price. Originally made in 2016, Tiffany 4121BF are lightweight plastic frames. Each pair of authentic Tiffany sunglasses ships worldwide with authenticity certificate, Tiffany box, case and a cleaning cloth. Buy Tiffany TF4121B sunglasses online at a friendly price. Originally made in 2016, Tiffany 4121B are lightweight plastic frames. Each pair of authentic Tiffany sunglasses ships worldwide with authenticity certificate, Tiffany box, case and a cleaning cloth. Buy Tiffany TF4108B sunglasses online at a friendly price. Originally made in 2016, Tiffany 4108B are lightweight plastic frames. Each pair of authentic Tiffany sunglasses ships worldwide with authenticity certificate, Tiffany box, case and a cleaning cloth. Buy Tiffany TF3052B sunglasses online at a friendly price. Originally made in 2016, Tiffany 3052B are lightweight metal frames. Each pair of authentic Tiffany sunglasses ships worldwide with authenticity certificate, Tiffany box, case and a cleaning cloth. Buy Tiffany TF4119 sunglasses online at a friendly price. Originally made in 2016, Tiffany 4119 are lightweight plastic frames. Each pair of authentic Tiffany sunglasses ships worldwide with authenticity certificate, Tiffany box, case and a cleaning cloth. Buy Tiffany TF4117B sunglasses online at a friendly price. Originally made in 2016, Tiffany 4117B are lightweight plastic frames. Each pair of authentic Tiffany sunglasses ships worldwide with authenticity certificate, Tiffany box, case and a cleaning cloth. Buy Tiffany TF4111B sunglasses online at a friendly price. Originally made in 2016, Tiffany 4111B are lightweight plastic frames. Each pair of authentic Tiffany sunglasses ships worldwide with authenticity certificate, Tiffany box, case and a cleaning cloth. Buy Tiffany TF3051B sunglasses online at a friendly price. Originally made in 2016, Tiffany 3051B are lightweight metal frames. Each pair of authentic Tiffany sunglasses ships worldwide with authenticity certificate, Tiffany box, case and a cleaning cloth. Buy Tiffany TF3049B sunglasses online at a friendly price. Originally made in 2016, Tiffany 3049B are lightweight metal frames. Each pair of authentic Tiffany sunglasses ships worldwide with authenticity certificate, Tiffany box, case and a cleaning cloth. Buy Tiffany TF4105HB sunglasses online at a friendly price. Originally made in 2015, Tiffany 4105HB are lightweight plastic frames. Each pair of authentic Tiffany sunglasses ships worldwide with authenticity certificate, Tiffany box, case and a cleaning cloth. Buy Tiffany TF4103HB sunglasses online at a friendly price. Originally made in 2015, Tiffany 4103HB are lightweight plastic frames. Each pair of authentic Tiffany sunglasses ships worldwide with authenticity certificate, Tiffany box, case and a cleaning cloth. Buy Tiffany TF3047K sunglasses online at a friendly price. Originally made in 2015, Tiffany 3047K are lightweight metal frames. Each pair of authentic Tiffany sunglasses ships worldwide with authenticity certificate, Tiffany box, case and a cleaning cloth. Buy Tiffany TF4089B sunglasses online at a friendly price. Originally made in 2014, Tiffany 4089B are lightweight plastic frames. Each pair of authentic Tiffany sunglasses ships worldwide with authenticity certificate, Tiffany box, case and a cleaning cloth. Buy Tiffany TF3044 sunglasses online at a friendly price. Originally made in 2014, Tiffany 3044 are lightweight frames. Each pair of authentic Tiffany sunglasses ships worldwide with authenticity certificate, Tiffany box, case and a cleaning cloth. Buy Tiffany TF4076 sunglasses online at a friendly price. Originally made in 2013, Tiffany 4076 are lightweight plastic frames. Each pair of authentic Tiffany sunglasses ships worldwide with authenticity certificate, Tiffany box, case and a cleaning cloth. Buy Tiffany TF4047B sunglasses online at a friendly price. Originally made in 2013, Tiffany 4047B are lightweight plastic frames. Each pair of authentic Tiffany sunglasses ships worldwide with authenticity certificate, Tiffany box, case and a cleaning cloth. Buy Tiffany TF3034 sunglasses online at a friendly price. Originally made in 2012, Tiffany 3034 are lightweight frames. Each pair of authentic Tiffany sunglasses ships worldwide with authenticity certificate, Tiffany box, case and a cleaning cloth.